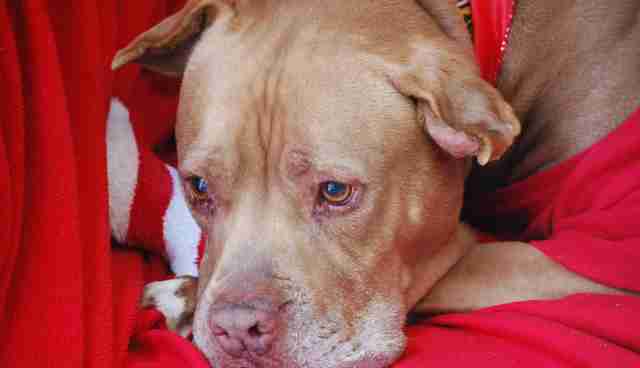 After 5 years of waiting in a shelter, there's only one thing Chester wants: a forever home. 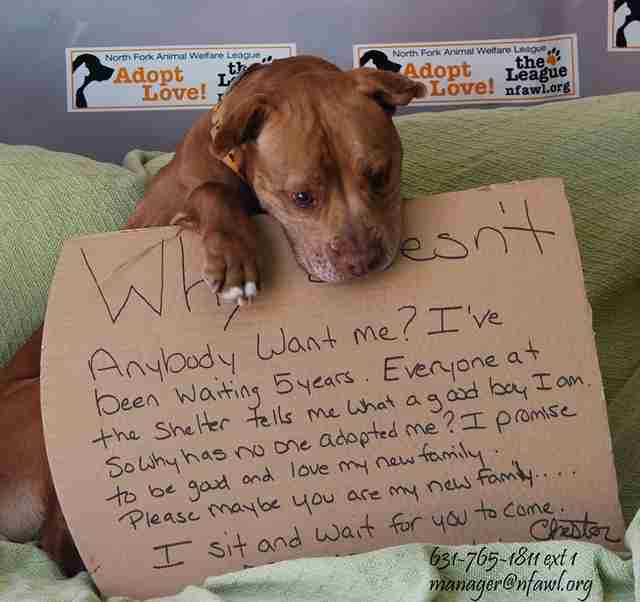 The North Fork Animal Welfare League in Southold, New York has been Chester's home since he was just a puppy, and on Wednesday the shelter uploaded this heartbreaking photo of the 6-year-old pit mix, holding up a plaintive plea for a family. Why doesn't anybody want me? I've been waiting 5 years. Everyone at the shelter tells me what a good boy I am. So why has no one adopted me? I promise to be good and love my new family. Please maybe you are my new family ... I sit and wait for you to come. 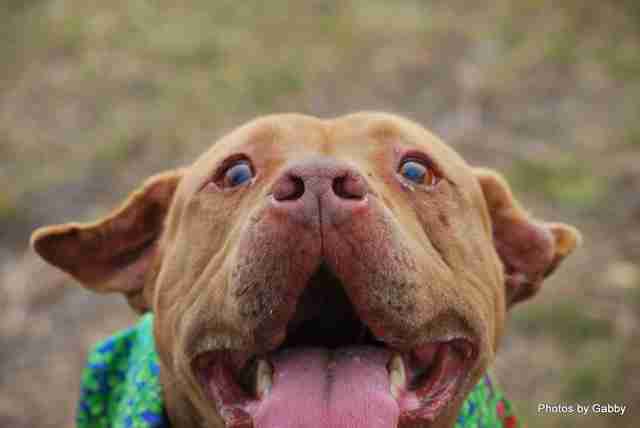 Chester also has a special Facebook page to help him find a forever family. Chester's interests include "snuggling on the couch, long walks, car rides and belly rubs." The sweet boy has been overlooked again and again. Pit bulls make up a disproportionate amount of adoptable dogs in shelters - which means there are lots of dogs like Chester who are waiting for a chance to show what great pets they'd be. 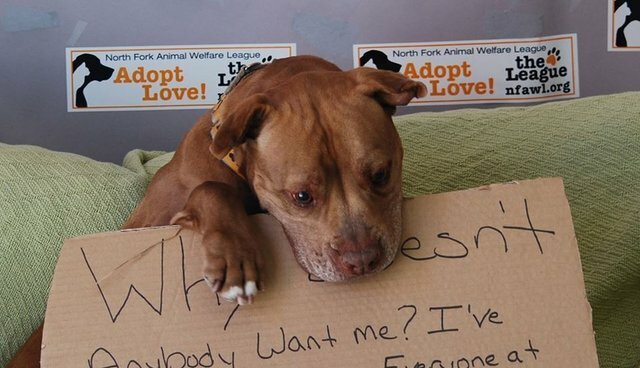 Things may be about to change for Chester: when the North Fork Animal shelter uploaded the photo of him with his sign, the pic quickly went viral. It's since been shared more than 10,000 times on Facebook. Hopefully that means the photo will reach Chester's perfect family, and he'll get the chance to shower some lucky humans with all the snuggles and kisses he's been waiting to share. To learn more about Chester and other animals like him, visit the North Fork Animal Welfare League's website. UPDATE 2 p.m.: Thanks to the inspiring reaction to Chester's photo, he's found his forever family! 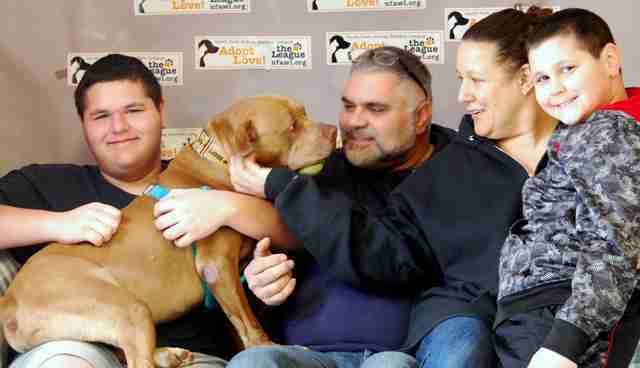 The shelter uploaded this heartwarming photo of Chester with his brand new forever family. He'll be heading to his new home on Saturday. Congrats buddy, you deserve it.